Cauliflower rice is all the rage and I had been trying my hardest to get on the bandwagon, but hadn’t yet fallen in love with the taste, until… I stumbled upon this cooking method. This recipe was inspired by a vegan meal in a box that my sister sent me through Green Chef, a local box of the week company. This recipe mixes cauliflower rice and short grain rice, to make an earthy, cauliflower flavored risotto. 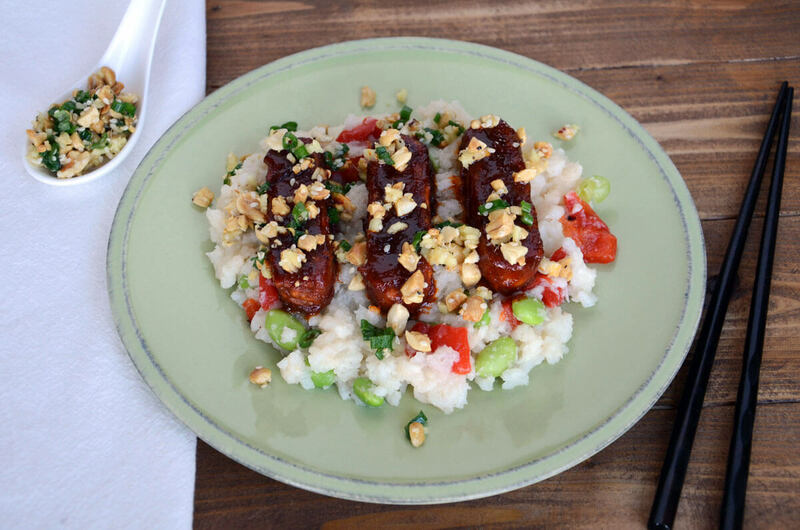 It is topped with some BBQ tempeh and a delicious scallion, peanut and ginger relish. The combination is a flavor burst! Bring 2 cups broth, rice and cauliflower rice to a boil in a pot. Add salt and pepper to taste. Reduce to low, simmer and cover. Simmer for 15-20 minutes until the rice is tender and liquid absorbed. You may need to add water if it dries out before it is cooked. Stir every once in a while to make sure it does not stick to the bottom. While the rice is cooking, chop the roasted peppers and edamame and set aside. Mix into the rice once cooked. Cut tempeh into rods, about ½ inch thick. Place in a medium bowl and coat with cornstarch. Heat a sautee pan with 2 TBS oil over medium heat. Add tempeh to hot pan and cook 2-3 minutes on each side, until browned. When browned, add BBQ sauce and ½-1 cup water. Cooke 7-10 minutes until sauce is reduced and thickly coating the tempeh. To make the peanut relish, combine the scallions, ginger, peanuts, sesame seeds, olive oil and salt and pepper to taste. To serve, place a portion of the cauliflower risotto on the bottom of the plate. Place a few pieces of tempeh with some sauce on top. Garnish with a few tablespoons of the peanut ginger relish.